Tires are made of rubber which means they don’t last forever. Gradual wear is normal as long as your suspension is up to snuff. But sometimes you may hit a pot hole or curb and damage your tire. You may not notice it at first but down the line, the tire can start to loose pressure or even tear apart. So then you put on your spare (you do have on don’t you) and then head on over to Elkhart Mechanics where they can check the tire and find out what caused the problem. Sometimes it can be fixed with a plug or patch but other times you’ll need a new tire. The good folks at Elkhart Mechanics can get you back on the road in no time. Tires are tough, but the road is full of potential hazards. Pot holes, debris in the road, unpaved surfaces, heat, and cold can cause damage to rubber tires. 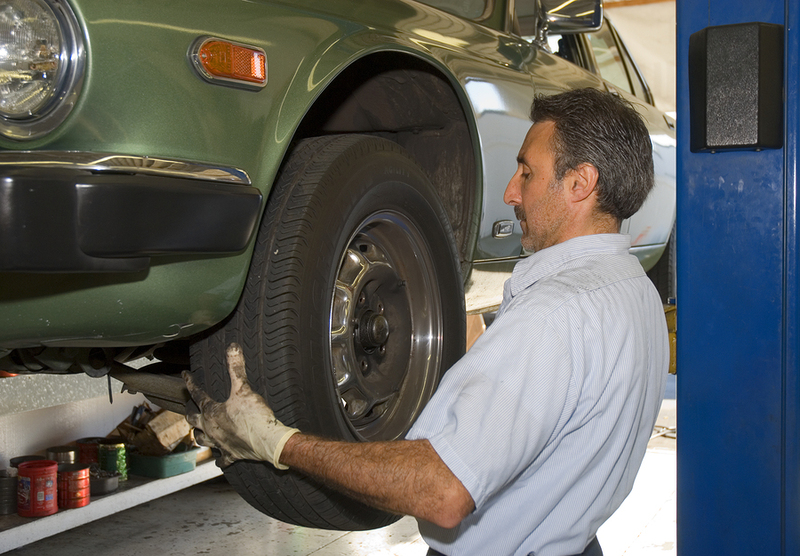 All tires need to be replaced eventually, but regular maintenance can prevent a lot of tire problems. Rotating and balancing your tires can prevent uneven wear. If your tire gets punctured when it runs over something sharp on the road, it is possible to repair the tire. Most tires in use today are steel belted radial tires, and with this kind of tires, it is very important to repair punctures promptly, even if the tire still has enough pressure that you can drive for awhile before the problem becomes really noticeable. The good news is that most tire punctures are small, less than one quarter of an inch by diameter. They are usually caused by nails and screws in the road. The bad news is that many drivers and second-rate tire repair shops fix tire punctures incorrectly. No successful tire repair can be accomplished without removing the tire from the car; when it comes to tire repair, there is no such thing as a truly quick fix. It is also not sufficient to patch the tire only on the inside. This leaves the outer surface of the patch vulnerable to moisture, and letting moisture into the tire can cause the body cord and steel belts to rust. Simply inserting a plug into the puncture is not a permanent solution, either, although it is acceptable to use one just drive to the repair shop to have the tire properly repaired. A good tire repair both seals the inner lining and fills the puncture. In other words, it requires both a patch and a plug. Some people use mushroom patches, which are a combination of a patch and a plug.